The aim of this article was to evaluate the reliability of vaginal fluid urea and creatinine levels for diagnosis of premature rupture of membranes (PROMs) and its relation to gestational age. PROMs occurs in 8–10% of all pregnant women at term. The risk of maternal and fetal infection increases as the time between the rupture of membrane and the onset of labor increases. It is therefore important to achieve accurate diagnosis by identifying the presence of specific amniotic fluid markers in vaginal environment. Vaginal fluid urea and creatinine levels may be helpful in the diagnosis of PROM because fetal urine is the most important source of amniotic fluid in the second half of pregnancy. A prospective case–control study was conducted. The study was performed on pregnant women in the third trimester between 28 and 42 weeks of gestation with a history of possible leakage of amniotic fluid, attending Menoufia University Hospitals and Quesina General Hospital during the period from January 2013 to December 2015. A total of 90 cases were subdivided into three groups: group I (30 cases) – confirmed PROM, group II (30 cases) – suspected PROM, and group III (30 cases) – control group. All patients underwent speculum examination, nitrazine paper test, and ultrasonography. The creatinine levels were 0.64 ± 0.018, 0.28 ± 0.013, and 0.14 ± 0.006 mg/dl in confirmed cases, suspected cases, and controls, respectively. The urea levels were 29.67 ± 3.75, 5.51 ± 0.87, and 1.63 ± 0.50 mg/dl in confirmed cases, suspected cases, and controls, respectively. There was a highly significant difference regarding creatinine level and urea level between the studied groups (P < 0.001). Sensitivity, specificity, positive predictive value, negative predictive value, and accuracy for creatinine level as a screening test for PROM were 98, 45, 40, 100, and 60%, respectively. Sensitivity, specificity, positive predictive value, negative predictive value, and accuracy for urea level as a screening test for PROM were 100, 100, 55, 100, and 70, respectively, with a cut-off value of 0.52 mg/dl for creatinine level and 11.8 mg/dl for urea level. Urea and creatinine level assays are reliable methods and have a higher sensitivity and specificity to establish accurate diagnosis. Premature rupture of the membranes (PROMs) constitutes one of the most important dilemmas in current obstetric practice; it could be defined as the rupture of the fetal membranes before the onset of labor irrespective of gestational age (GA) . PROMs occur in 8–10% of all pregnant women at term. A prolonged interval from rupture of membranes to delivery is associated with an increase in the incidence of chorioamnionitis and neonatal sepsis . The risk of maternal and fetal infection increases as the time between the rupture of membranes and the onset of labor increases. Maternal infection is termed chorioamnionitis, whose incidence varies from 3 to 15% of cases of PROM, whereas fetal infection may occur as septicemia, pneumonia, skin infection, urinary tract infection, or local infections such as, omphalitis (infection of the umbilical cord) or conjunctivitis. Fetal infection occurs in 5% of all cases of PROM and in 15–20% of those with chorioamnionitis . It is therefore important to achieve accurate diagnosis by identifying the presence of specific amniotic fluid markers in vaginal environment. These tests include measurement of vaginal pH, prolactin, α fetoprotein, diamine oxidase, insulin-like growth factor binding protein-1, human chorionic gonadotropin, and fetal fibronectin. All these tests have their advantages and drawbacks ,. Vaginal fluid urea and creatinine levels may be helpful in the diagnosis of PROM, because fetal urine is the most important source of amniotic fluid in the second half of pregnancy . Accordingly, in the near future, a vaginal dipstick may be designed to diagnose PROM in a reliable, simple, accurate, and rapid way. Consequently, the simplicity of this test may make it attractive in our clinical practice. 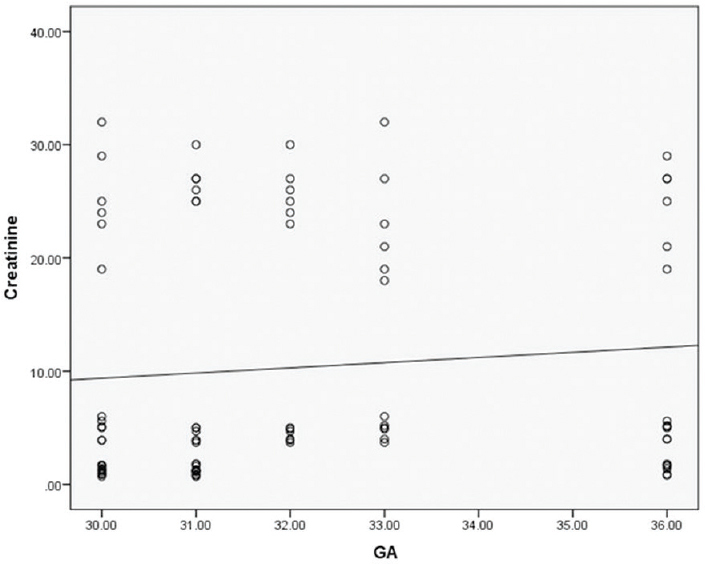 The aim of the study was to evaluate the reliability of vaginal fluid urea and creatinine levels for the diagnosis of PROM and its relation to GA. The study was a prospective case–control study performed on pregnant women in the third trimester between 28 and 42 weeks of gestation with history of possible leakage of amniotic fluid attending Menoufia University Hospitals and Quesina General Hospital during the period from January 2013 to December 2015. After approval of the local Institutional Ethical Committee of Menoufia University Hospitals, informed consent was taken from patients after explaining about the aim of this study and procedure. 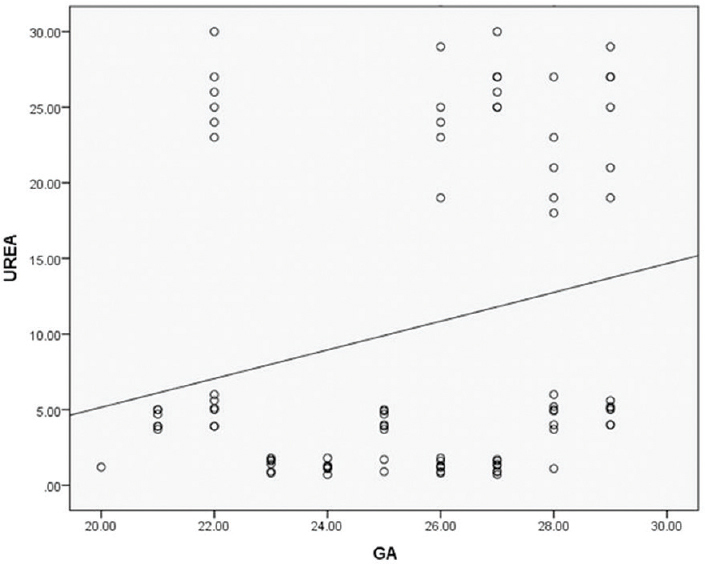 A total of 90 singleton pregnant women with GA 28–42 weeks were included in this study. Any amount of vaginal bleeding either spontaneous or traumatic present on speculum examination, prenatal complications (e.g., liver diseases diagnosed by liver function tests and liver enzymes, kidney diseases diagnosed by kidney function tests, hypertension, diabetes mellitus diagnosed by measuring fasting random blood sugar and glucose tolerance test, Rh sensitized, women with serum creatinine level ≥0.9 mg/dl, chorioamnionitis, and dysmorphic features suggestive of chromosomal abnormalities and evaluated through genetic study), and multiple pregnancies were the reasons for exclusion. Sample size was based on prior review of literature . Creatinine level in PROM group was 1. 45 ± 0.26 mg/dl and in control group was 0.42 ± 0.20 mg/dl. The sample size had been calculated at 95% confidence interval, power 80%, and α error at 0.5. A total of 90 cases were included in the study. The sample was distributed into 30 cases controls, 30 cases confirmed PROM, and 30 suspected PROM. Group III (30 cases) (control group): patients without any complaint or complication with negative amniotic fluid pooling and negative nitrazine paper test result, and normal AFI by ultrasonography. After explaining about the aim of this study and procedure to the patients and obtaining informed consent, the patients were included. A thorough history was taken, and physical examination was done. All patients underwent a sterile speculum examination and amniotic fluid pooling with or without Valsalva maneuver. Nitrazine paper test was done for all cases as a screening test for amniotic fluid leak and an abdominal ultrasonography for GA, AFI, fetal viability, placental site, and congenital anomalies. Vaginal fluid washing was done through flushing of 3 ml saline in the posterior vaginal fornix, and then all the fluid was aspirated from posterior fornix for detection of urea and creatinine levels. Each specimen was centrifuged at 5000 rpm, and the supernatant fluid was separated. Measurements of both urea and creatinine levels were performed by enzymatic urease method and rate Gaffe method, respectively, to determine their exact level . Data were collected, tabulated, and statistically analyzed by computer using SPSS (SPSS Inc., Chicago, Illinois, USA). Two types of statistics were done. Quantitative data are expressed to measure the central tendency of data and diversion around the mean, mean, and SD. Qualitative data were expressed in number and percentage. χ Test was used to compare between categorical variables. Pearson correlation (r) was used to detect association between quantitative variables. There was a nonsignificant difference regarding age (years) and GA (weeks) at sampling between the studied groups (P = 0.060 and 0.259, respectively) [Table 1]. There was a nonsignificant difference regarding gravidity between the studied groups (P = 0.430) [Table 1]. There was a highly significant difference regarding creatinine level and urea level between the studied groups (P < 0.001). The creatinine levels were 0.64 ± 0.018, 0.28 ± 0.013, and 0.14 ± 0.006 mg/dl in confirmed cases, suspected cases, and controls, respectively [Table 2]. The urea levels were 29.67 ± 3.75, 5.51 ± 0.87, and 1.63 ± 0.50 mg/dl in confirmed cases, suspected cases, and controls, respectively [Table 2]. There was a highly significant difference regarding AFI between the studied groups [Table 3]. There was a significant positive correlation between creatinine and urea levels on one side and GA on the other side (P < 0.001). There was a nonsignificant correlation between creatinine and urea levels in one side and age on the other side (P = 0.098 and 0.851, respectively) [Table 4]. The validity of creatinine level, urea level, and AFI as a screening test for PROM was done as shown in [Table 5]. 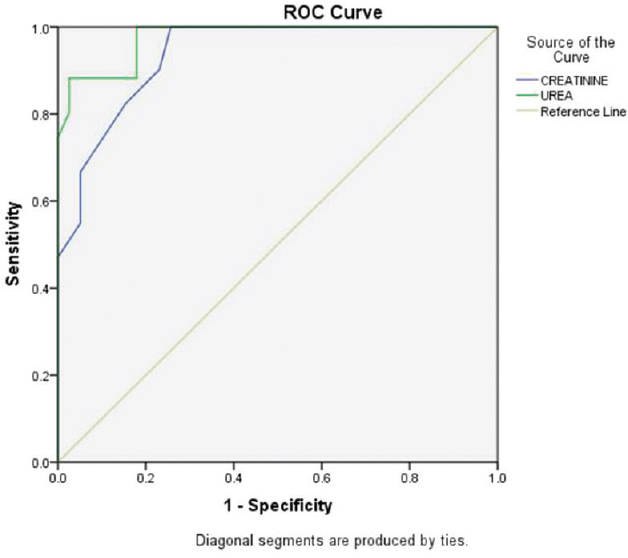 Sensitivity, specificity, positive predictive value (PPV), negative predictive value (NPV), and accuracy for creatinine level as a screening test for PROM were 98, 45, 40, 100, and 60%, respectively. Sensitivity, specificity, PPV, NPV, and accuracy for urea level as a screening test for PROM were 100, 100, 55, 100, and 70%, respectively. Sensitivity, specificity, PPV, NPV, and accuracy for AFI as a screening test for PROM were 44, 100, 100, 55, and 67%, respectively. The area under the curve was 93 and 97 for creatinine and urea levels, respectively [Figure 1], [Figure 2], [Figure 3]. Figure 1: Accuracy of vaginal fluid creatinine and urea levels in differentiating cases and controls. Figure 2: Correlation between vaginal creatinine level and gestational age. Figure 3: Correlation between urea level and gestational age. This study was designed to evaluate the reliability of vaginal fluid urea and creatinine levels for the diagnosis of PROMs. This study showed that there was a highly significant difference of creatinine level and urea level in the studied groups. The creatinine level was 0.64 ± 0.018, 0.28 ± 0.013, and 0.14 ± 0.006 mg/dl, in confirmed cases, suspected cases, and controls, respectively. The urea levels were 29.67 ± 3.75, 5.51 ± 0.87, and 1.63 ± 0.50 mg/dl in confirmed cases, suspected cases, and controls, respectively. This was in agreement with Hussein et al. who found a statistically significant difference between group I (confirmed PROM) and group II (control) regarding vaginal fluid urea and creatinine levels, as the mean vaginal fluid urea and creatinine levels were 40.3 ± 9 and 1.45 ± 0.26 mg/dl, respectively, in group I versus 7.8 ± 2.8 and 0.42 ± 0.20 mg/dl, respectively, in group II. According to Effat et al. , there was a highly significant statistical difference among confirmed, suspected, and control groups regarding creatinine level in vaginal fluid. This study showed that there was highly significant difference regarding AFI between the studied groups. AFI less than or equal to 5 was present in 100% of confirmed cases, 80% of suspected cases, and 40% of controls. This was in agreement with Reham et al. who found that there was significant statistical difference between confirmed, suspected, and control groups regarding AFI. The number of patients with AFI less than or equal to 9 cm was 32 patients in the confirmed group, 17 patients in the suspected group, and four patients in the control group. On the contrary, 18 patients in confirmed group had AFI greater than 9 cm. Our results are supported by the results obtained by Shetty et al. , which stated that PROM is more marked in multigravida. This study showed the validity of creatinine level, urea level, and AFI as screening tests for PROMs. For creatinine level, the cut-off value was 0.22, and the sensitivity, specificity, PPV, NPV, and accuracy were 100, 45, 40, 100, and 60%, respectively. For urea, the cut-off value was 7.50, and the sensitivity, specificity, PPV, NPV, and accuracy were 100, 53, 55, 100, and 70%, respectively. The cut-off value for AFI was 5, and the sensitivity, specificity, PPV, NPV, and accuracy were 44, 100, 100, 55, and 67%, respectively. Li and Chang  have found that the median levels of creatinine in vaginal fluid of normal pregnant woman and pregnant woman with confirmed PROM were 0.05 and 0.95 mg/dl, respectively. The sensitivity, specificity, PPV, NPV, and accuracy were 90, 100, 100, 90.9, and 95% respectively. Ahmed et al. stated that the sensitivity, specificity, PPV, NPV, and accuracy were all 100% for vaginal fluid creatinine level and were 100, 83, 100, 100, and 85.6%, respectively, for urea in detecting PROM, with a cut-off value of 0.31 mg/dl for creatinine and 13.2 mg/dl for urea. Kariman et al. , stated that vaginal fluid concentrations of urea and creatinine were significantly different among the three groups. The sensitivity, specificity, PPV, NPV, and accuracy were all 100% in detecting PROMs by evaluation of vaginal fluid creatinine concentration, with a cut-off value of 0.45 mg/dl. Urea and creatinine assays are reliable methods and have a higher sensitivity and specificity to establish accurate diagnosis. Ngwenya S, Lindow S. 24 hour rhythm in the timing of premature labor spontaneous rupture of membranes at term. Eur J Obstet Gvnecol Reprod Biol 2007; 112:151–320. Shabana AA, El kilani O, El kholy NI, Tayel SM. Comparison of oral misoprostol and oxytocin for labor induction in prelabor rupture of membranes at term. Menouf Med J 2015; 28:239–244. Benedetto C, Tibaldi C, Marozio L, Marini S, Masuelli G, Pelissetto S, et al. Cervicovaginal infections during pregnancy: epidemiological and microbiological aspects. J Matern Fetal Neonatal Med 2006; 16:9–12. Esim E, Turan C, Unal O, Dansuk R, Cengijoglu B. Diagnosis of premature rupture of membranes by identification of B-HCG in vaginal washing fluid. Eur J Obstet Gynecol Reprod Biol 2003; 101:37–40. Kafali H, Oksuzler C. Vaginal fluid urea and creatinine in diagnosis of premature rupture of membranes. Arch Gynecol Obstet 2007; 275:157–160. Hussein M, Khaled M, Gamal A. Vaginal fluid urea and creatinine for diagnosis of premature rupture of membranes. N Y Sci J 2014; 7:7–10. Wiberg-Itzel E, Nordstrom L. Lactate determination in vaginal fluid: a new method in the diagnosis of prelabor rupture of membranes. BJOG 2005; 112:754. Effat D, Elkafrawy M, Elbagoury E. The role of vaginal fluid creatinine versus human chorionic gonadotropin in diagnosis of premature rupture of membrane. AAMJ 2012; 10:299–317. Reham S, Rashed, Rabee A, Hassanein A, Sahar M. Vaginal fluid creatinine versus human chorionic gonadotropin for diagnosis of premature rupture of membranes. J Am Sci 2015; 11:3339. Shetty A, Stewart K, Stewart G, Rice P, Danielian P, et al. Active management of term prelabour rupture of membranes with oral misoprostol. BJOG 2002; 109:1354–1358. Li HY, Chang TS. Vaginal fluid creatinine, human chorionic gonadotropin and alpha-fetoprotein levels for detecting premature rupture of membranes. Zhonghua Yi Xue Za Zhi 2000; 63:686–690. Ahmed M, Maged M, Walaa A, Ibrahim M. The value of measurement of vaginal fluid urea, creatinine and beta HCG in the diagnosis of premature rupture of membranes. Kasr Al-Aini J 2011; 2:2. Kariman M Hedayati M, Allvi SH. The role of vaginal prolactin in diagnosis of premature rupture of membranes. Iran Red Crescent Med J 2012; 14:352–357.